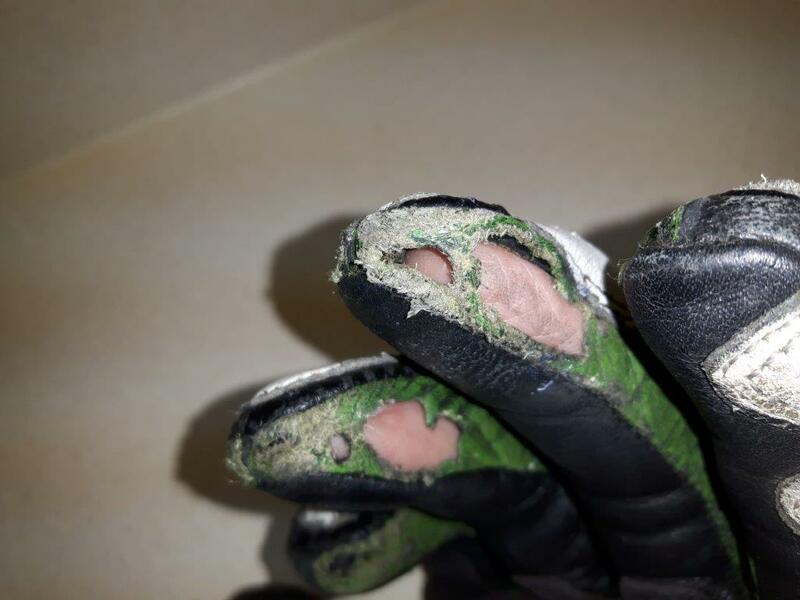 Because of your post I just went down to the basement and checked my gloves to also find some thinning on the clutch fingers. I dunno, maybe a fellow could spray some plastic type coating on the high wear areas? 4 years and much more than the average use - I think your first sentence nailed it, no need to complain. Gear has a finite shelf life - toss those and replace. I stopped buying expensive gloves (Alpinestars & Dainese) because of the number of pairs I've gone through. Now I buy inexpensive ones off eBay. I most recently took a chance on these ones and they're holding up just as well as my former Alpinestars. The quality is actually really good. ^^^ great tip. looks like a good glove, and the price is incredible! what did you do to determine correct sizing? interesting you should mention that. my commuting / general touring glove is a Held Sparrow, which I bought for only $70 at Vanc BMW / Ducati three years back. I have about 25,000 kms on them, and they show NO wear at all. ( minor scuffing on the back of one from when I went skittering in Utah a couple springs ago...) simple gloves, with no plastic or carbon, etc, but great leather, good padding, impeccible construction, excellent security, and day-long comfort. not going to be wearing out the inside of the finger boxes on those! I just wore a favourite of mine, a set of Rev-it summer leather/Gore-Tex short gloves. As mentioned above, I’m getting tired of investing serious money into brand name gloves, they wear out just as quick. Have to admit, I must have 15 pair, of every category. My go to right now, for really cold, my old Widder electric gauntlets, spring and summer, I’ve bought an $18 Cycle Gear vented armoured leather shorties from their giant bin at their front door. The things work great, fine dexterity, holding great after a full season last year. Still have my very 1st set of gloves from 40 years ago, Watson gauntlets, would like to get them rebuilt, somehere, using the original rear section, which must be made of hardwood-moose leather hybrid. i said it, as it's what i use also.. full bias. but same difference (only 1 finger); at the end of the day everything wears it just depends how quickly. I think its mostly the fact its kangaroo leather, it does require a bit more 'care' than other leathers, the palms / fingers sure are soft though..
Last edited by bacchus40; 03-25-2019 at 10:36 PM. I wear medium everything and given the low price, I just took a chance and they fit a little tight but stretched out. I figured that if they didn't fit I could always re-sell them on craigs and not lose anything. The only knock that I have for these gloves is that the soft side of the Velcro seems to be puffing up faster than with my other gloves. However, bulk Velcro is available at any fabric store and I figure I'll remove the soft side and ShoeGoo a new patch onto the gauntlet if it becomes a problem. Last edited by Porschenut; 03-26-2019 at 11:22 AM. it's actually your acidic sweat that breaks it down. My racing gloves always go this way, and not from crashing. The sweat just kills the leather eventually.